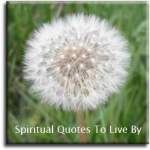 These Native American quotes are words of great wisdom that offer simple, inspirational guidance in living a spiritual, peaceful life. Previously, this page contained Native American quotes that were not attributed to any particular person or tribe. They were all the quotes I had come across over the years that stated they were Native American. The few quotes that I had from specific Native American people were added to the pages relevant to their quote. The older picture-quotes will just have 'Native American' on them, rather than the newly found source. I will add more (with the right names) over time. Martin Luther King said, "I have a dream." But we Indians didn't have a dream, we had a reality. A warrior who had more than he needed would make a feast. He went around and invited the old and needy. All over the sky a sacred voice is calling your name. Great Spirit, the good road and the road of difficulties you have made me cross; and where they cross, the place is holy. Grown men can learn from very little children, for the hearts of the little children are pure. Therefore, the Great Spirit may show to them many things which older people miss. I cured with the power that came through me. Of course, it was not I who cured, it was the power from the Outer World; the visions and ceremonies only made me like a hole through which the power could come to the two-leggeds. If I thought that I was doing it myself, the hole would close up and no power could come through. Look to the old, they are worthy of old age; they have seen their days and proven themselves. With the help of the Great Spirit, they have attained a ripe old age. At this age the old can predict or give knowledge or wisdom, whatever it is, it is so. Perhaps you have noticed that even in the slightest breeze you can hear the voice of the cotton tree; this we understand is its prayer to the Great Spirit, for not only men, but all things and all beings pray to Him continually in different ways. The first peace, which is the most important, is that which comes within the Souls of people when they realize their relationship, their oneness with the universe and all its powers, and when they realize at the center of the universe dwells the Great Spirit, and that its center is really everywhere, it is within each of us. This is the real peace, and the others are but reflections of this. The second peace is that which is made between two individuals, and the third is that which is made between two nations. But above all you should understand that there can never be peace between nations until there is known that true peace, which, as I have often said, is within the Souls of men. You showed me… the spirit shape of things as they should be. You have shown me, and I have seen. So it is with Waken Tanka, we believe that He is everywhere. When a man does a piece of work which is admired by all we say that it is wonderful; but when we see the changes of day and night, the sun, the moon, and the stars in the sky, and the changing seasons upon the Earth, with their ripening fruits, anyone must realize that it is the work of someone more powerful than man. We never quarrel about the Great Spirit. You must speak straight so that your words may go as sunlight to our hearts. We cannot waste one drop of our energy. We must live and change with the world around us. When the sun goes down, he opens his heart to God, and earlier than the sun appears on the hills, he gives thanks for his protection during the night. Upon suffering beyond suffering: the Red Nation shall rise again and it shall be a blessing for a sick world. A world filled with broken promises, selfishness and separations. A world longing for light again. 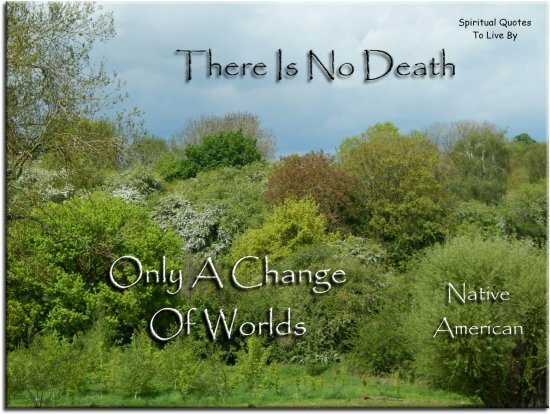 I see a time of Seven Generations when all colors of mankind will gather under the Sacred Tree of Life and the whole Earth will become one circle again. In that day, there will be those among the Lakota who will carry knowledge and understanding of unity among all living things and the young white ones will come to those of my people and ask for this wisdom. I salute the light within your eyes where the whole Universe dwells. For when you are at that centre within you and I am that place within me, we shall be one. It is the flash of firefly in the night. It is the breath of a buffalo in the wintertime. It is the little shadow which runs across the grass and loses itself in the sunset. Love is something you and I must have. We must have it because our spirit feeds upon it. We must have it because without it we become weak and faint. Without it our courage fails. Without love, we can no longer look confidently at the world. We turn inward.. And little by little we destroy ourselves. With it, we are creative. With it, we march tirelessly. With it, and with it alone, we are able to sacrifice for others. May the stars carry your darkness away. My friends, how desperately do we need to be loved and to love. With it we are creative. With it we march tirelessly. With it, and with it alone, we are able to sacrifice for others. the fragrance of the grass... speaks to me. the rhythm of the sea... speaks to me. the dew drop on the flower... speaks to me. and the life that never goes away. From Wakan Tanka, the Great Mystery, comes all power. It is from Wakan Tanka that the holy man has wisdom and the power to heal and make holy charms. Man knows that all healing plants are given by Wakan Tanka, therefore they are holy. So too is the buffalo holy, because it is the gift of Wakan Tanka. The Indian needs no writings; words that are true sink deep into his heart where they remain in silence. He never forgets them. I was warmed by the sun, rocked by the winds, and sheltered by the trees as other Indian babes. Sometimes we prayed in silence; sometimes each one prayed aloud; sometimes an aged person prayed for all of us - and to Usen. There is one God looking down on us all. We are all children of one God. God is listening to me. The sun, the darkness, the winds, are all listening to what we now say. When a child my mother taught me the legends of our people; taught me of the sun and sky, the moon and stars, the clouds and storms. She also taught me to kneel and pray to Usen for strength, health, wisdom and protection. May the Lord bring you out of all your troubles. Trust your course with Him. Stand fast and remain united and all will soon be well. We, the great mass of the people, think only of the love we have for our land, for we do love the land where we were brought up. The Great Spirit is looking at me and will hear me. We were contented to let things remain as the Great Spirit made them. The Great Spirit has smiled upon us and made us glad. Every human being has a sacred duty to protect the welfare of our Mother Earth, from whom all life comes. In order to do this we must recognize the enemy.. the one within us. We must begin with ourselves. The greatest power is the Creator. But, if you want to know the greatest strength.. That is gentleness. We are the spiritual energy that is thousands of times stronger than nuclear energy. Our energy in the combines will of all people with the spirit of the Natural World, to be of one body, one heart and one mind for peace. We must live in harmony with the Natural World. Conversation was never begun at once, nor in a hurried manner. No one was quick with a question, no matter how important, and no one was pressed for an answer. A pause giving time for thought was the truly courteous way of beginning and conducting a conversation. Silence was meaningful with the Lakota, and his granting a space of silence to the speech-maker and his own moment of silence before talking was done in the practice of true politeness and regard for the rule that, thought comes before speech. If today I had a young mind to direct, to start on the journey of life, and I was faced with the duty of choosing between the natural way of my forefathers and that of the present way of civilization, I would, for its welfare, unhesitantly set that child’s feet in the path of my forefathers. I would raise him to be an Indian. Out of the Indian approach to life there came a great freedom, an intense and absorbing respect for life, enriching faith in a Supreme Power and principles of truth, honesty, generosity, equity, and brotherhood as a guide to mundane relations. The American Indian is of the soil, whether it be the region of forests, plains, pueblos, or mesas. He fits into the landscape, for the hand that fashioned the continent also fashioned the man for his surroundings. He once grew as naturally as the wild sunflowers, he belongs just as the buffalo belonged. The old Lakota was wise. He knew that a man’s heart away from nature becomes hard. He knew that lack of respect for growing, living things soon led to lack of respect for humans, too. So he kept his children close to nature’s softening influence. We did not think of the open plains, the beautiful rolling hills, the winding streams with tangled growth as wild. Only the white man was nature a wilderness, and only to him was it ‘infested’ with ‘wild’ animals and ‘savage’ people. To us it was tame. Earth was bountiful and we were surrounded with the blessings of the Great Mystery. Once I was in Victoria, and I saw a very large house. They told me it was a bank and that the white men place their money there to be taken care of, and that by and by they got it back with interest. We are Indians and we have no such bank; but when we have plenty of money or blankets, we give them to other chiefs and people, and by and by they return them with interest, and our hearts feel good. Our way of giving is our bank. Children were encouraged to develop a strict discipline and a high regard for sharing. When a girl picked her first berries and dug her first roots, they were given away to an elder so she would share her future success. When a child carried water for the home, an elder would give compliments, pretending to taste meat in water carried by a boy or berries in that of a girl. The child was encouraged not to be lazy and to grow straight like a sapling. 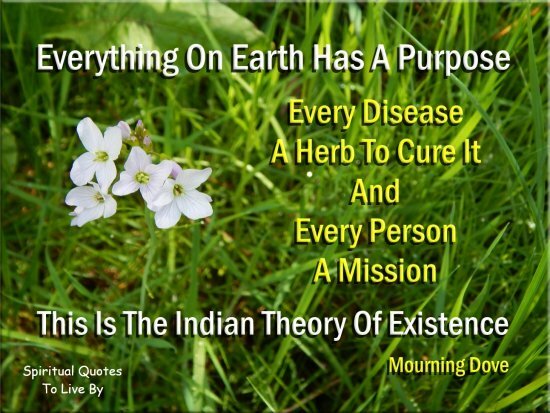 Everything on Earth has a purpose, every disease a herb to cure it, and every person a mission. This is the Indian theory of existence. Never has the Earth been so lovely nor the sun so bright, as today. Each Soul must meet the morning sun, the new, sweet Earth and the Great Silence, alone. It is our belief that the love of possessions is a weakness to be overcome. Its appeal is to the material part, and if allowed its way, it will in time disturb one’s spiritual balance. Therefore, children must early learn the beauty of generosity. They are taught to give what they prize most, that they may taste the happiness of giving. We were taught generosity to the poor and reverence for the Great Mystery. Religion was the basis of all Indian training. Whenever, in the course of the daily hunt, the hunter comes upon a scene that is strikingly beautiful, or sublime - a black thundercloud with the rainbow’s glowing arch above the mountain, a white waterfall in the heart of a green gorge, a vast prairie tinged with the blood-red of the sunset - he pauses for an instant in the attitude of worship. All birds, even those of the same species, are not alike, and it is the same with animals and with human beings. The reason Wakan Tanka does not make two birds, or animals, or human beings exactly alike is because each is placed by Wakan Tanka to be an independent individuality and to rely upon itself. All living creatures and all plants derive their life from the sun. 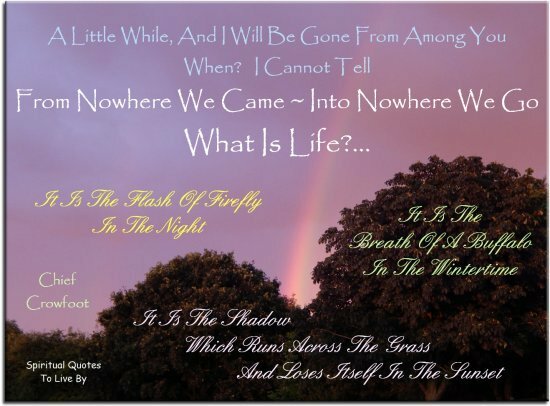 if it were not for the sun, there would be darkness and nothing would grow - the earth would be without life. Yet the sun must have the help of the earth. If the sun alone were to act upon animals and plants, the heat would be so great and they would die, but there are clouds that bring rain, and the action of the sun and earth together supplies the moisture that is needed for life. The roots of a plant go down, and the deeper they go the more moisture they find. This is according to the laws of nature and is one of the evidences of the wisdom of Wakan Tanka. From my boyhood I have observed leaves, trees, and grass, and I have never found two alike. They may have a general likeness, but on examination I have found that they differ slightly. It is the same with animals… it is the same with human beings, there is some place which is best adapted to each. Although we are in different boats, you in your boat and we in our canoe, we share the same river of life. I do not see a delegation for the four-legged, I see no seat for the eagles. We forget and we consider ourselves superior, but we are, after all, a mere part of creation and we must consider to understand where we are. And we stand somewhere between the mountain and the ant, as part and parcel of Creation. Science can point out dangers, but science cannot turn the direction of minds and hearts. That is the province of spiritual powers within and without, our very beginnings, powers that are mysteries of life itself. The environment isn’t over here. The environment isn’t over there. We say that the faces of coming generations are looking up from the Earth. So when you put your foot down, you put your foot down very carefully - because there are generations coming one after another. If you think in these terms, then you’ll walk a lot more carefully, be more respectful of this Earth. What you people call your natural resources, our people call our relatives. This brings rest to my heart, I feel like a leaf after a storm, when the wind is still. God Almighty has made us all. We do not want riches but we do want to train our children right. Riches would do us no good. We could not take them with us to the other world. We do not want riches. We want peace and love. No one ever saw an Indian destroy something the Great Creator gave to man for his needs. All things share the same breath: the beast, the tree the man. The air shares its spirit with all the life it supports. Day and night cannot dwell together. Your religion was written on tables of stone, ours was written on our hearts. How can you buy or sell the sky, the warmth of the land? The idea is strange to us. If we do not own the freshness of the air and the sparkle of the water, how can you buy them? Every part of this Earth is sacred to my people. We are part of the Earth and it is part of us. The perfumed flowers are our sisters - the deer, the horse, the great eagle - these are our brothers. Whatever befalls the Earth befalls the sons of the Earth. If men spit upon the ground, they spit upon themselves. All things are connected like the blood which unites one's family. All things are connected. Our bare feet are conscious of the sympathetic touch of our ancestors as we walk over this Earth. Our God is also your God. The Earth is precious to Him. We are all children of the Great Spirit, we all belong to Mother Earth. Will you teach your children what we have taught our children? That the Earth is our mother? What befalls the Earth befalls the sons of the Earth. This we know: the Earth does not belong to man, man belongs to the Earth. All things are connected like the blood that unites us all. Man did not weave the web of life, he is merely a strand in it. Whatever he does to the web, he does to himself. Return not evil for evil, as this would offend the Great Spirit. The monitor within my breast has taught me the will of the Great Spirit. I am here by the will of the Great Spirit, and by His will I am a chief. I know the Great Spirit is looking down upon me from above, and will hear what I say. Certain small ways and observances sometimes have connection with large and more profound ideas. This hand is not the color of yours, but if you pierce it, I shall feel pain. If you pierce your hand, you also feel pain. The blood that will flow from mine will be the same color as yours. I am a man. God made us both. Although ice and snow may lie deep upon my wigwam, I should find a warm fire within. And robs their spirit of its vision. When you are in doubt, be still, and wait. When doubt no longer exists for you, then go forward with courage. So long as mists envelop you, be still. Be still until the sunlight pours through and dispels the mists, as it surely will.. Then act with courage. The old Indian teaching was that it is wrong to tear loose from its place on the Earth anything that may be growing there. It may be cut off, but it should not be uprooted. The trees and the grass have spirits. Whenever one of such growth may be destroyed by some good Indian, his act is done in sadness and with a prayer for forgiveness because of his necessities. Do right always. It will give you satisfaction in life.